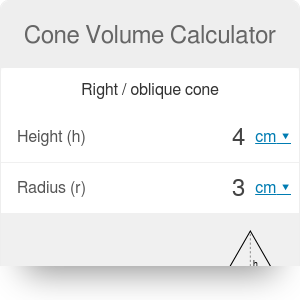 This cone volume calculator can help in solving your school problems or can answer your weird day-to-day questions. How much ice cream does it fit into my cone? How much cream can I put into the pastry bag? Or what's the volume of my conical champagne glass? If these are the questions which bother you every day, keep reading! Let's calculate how much water does it fit into the conical part of the funnel. Determine the height of the cone. For our funnel, it's 4 in. Enter the base radius. It may be equal to 3 in. The volume of the cone is displayed in the calculator - in our case, it's 37.7 cu in. Remember that you can change the units to meet your exact needs - click on the unit and select from the list. If you need simple volume unit conversion, check out our volume converter tool. An example of the volume of a truncated cone calculation can be found in our potting soil calculator, as the standard flower pot is a frustum of a cone. An oblique cone is a cone with an apex that is not aligned above the center of the base. It "leans" to one side, similarly to the oblique cylinder. The cone volume formula of the oblique cone is the same as for the right one. Cone Volume Calculator can be embedded on your website to enrich the content you wrote and make it easier for your visitors to understand your message.